Melanie Gideon’s latest book, Valley of the Moon, features a town lost in time and a modern woman who can slip back and forth between the past and the present. 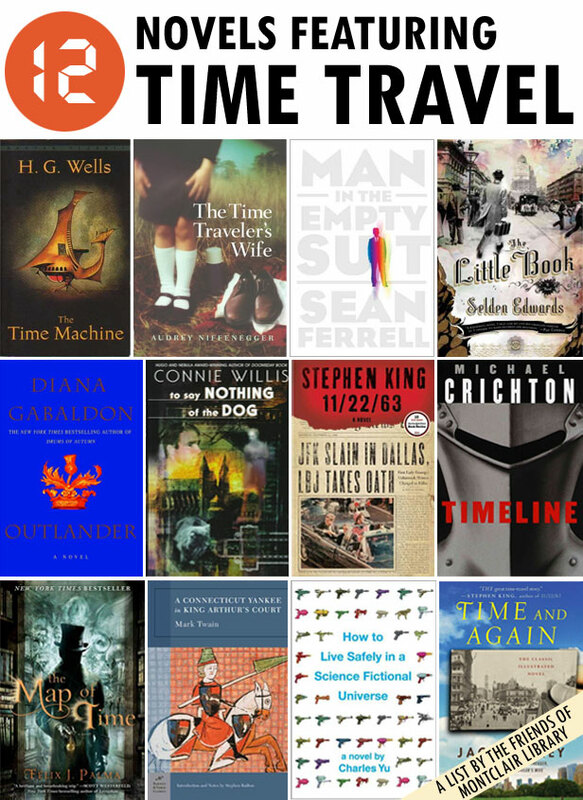 To get you ready for Gideon’s visit to the library September 27, here are 12 novels featuring time travel. Many of these books go beyond traditional science fiction and work on multiple levels as mysteries, romances, thrillers, historical fiction and other genres. The Time Machine by H.G. Wells (SF WELLS) – The classic story depicting the adventures of the Time Traveler whose fantastic invention carries him into the world of 802,701 AD. The Time Traveler’s Wife by Audrey Niffenegger (FIC NIFFENEGG) – Passionately in love, Clare and Henry vow to hold onto each other and their marriage as they struggle with the effects of Chrono-Displacement Disorder, a condition that casts Henry involuntarily into the world of time travel. Man in the Empty Suit by Sean Ferrell (FIC FERRELL) (not at Montclair) – A time traveler attends his own one-hundredth birthday celebration every year with other versions of himself – until in his thirty-ninth year he encounters his murdered forty-year-old body, a situation that compels him to race against time to prevent his own death. The Little Book by Selden Edwards (FIC EDWARDS) – The exiled scion of a prominent Boston banking family, forty-seven-year-old Wheeler Burden is living in 1988 San Francisco until he is mysteriously transported to fin de sicle Vienna, a city that he finds strangely familiar, where he finds a mentor in Sigmund Freud, falls in love with a young American woman and gains insight into the war-hero father he never knew. The Map of Time by Félix J. Palma (not at Montclair) – In Victorian era London, a skeptical H.G. Wells is called upon to investigate purported incidents of time travel and to save lives and literary classics, including Dracula and The Time Machine, from being wiped out of existence. Outlander by Diana Gabaldon (FIC GABALDON) – In 1945, Claire Randall, a former combat nurse, touches a boulder in an ancient stone circle and finds herself in a Scotland torn by war — in the year 1743. To Say Nothing of the Dog, or, How We Found the Bishop’s Bird Stump at Last by Connie Willis (SF WILLIS) (not at Montclair) – In this comedy, Ned Henry from the year 2048 goes back to 1889 to study the Coventry Cathedral for a wealthy American, and when one of his associates rescues a feline in distress causing the timeline to be altered, Ned must race against time to restore history. Willis’s Doomsday Book also centers around time travel. 11/22/63: A Novel by Stephen King (FIC KING) – On November 22, 1963, three shots rang out in Dallas, President Kennedy died, and the world changed. What if you could change it back? How to Live Safely in a Science Fictional Universe by Charles Yu (SF YU) (not at Montclair) – In a world transformed by time-travel technology, counselor Charles Yu (not to be confused with author Charles Yu) searches for the father who invented time travel and vanished, a quest marked by quirky pseudo-companions. A Connecticut Yankee in King Arthur’s Court by Mark Twain – In this early time travel book (published in 1889), a blow to the head transports a nineteenth-century New Englander to 528 A.D., where he proceeds to modernize King Arthur’s kingdom.